Championship Saturday is less than a week away and we’ve already crowned state champions in each of the Eight-Man classifications. Kpreps will continue to post state rankings throughout the playoffs culminating in our final poll after the state champions are crowned. Let’s take a look at the Kpreps.com rankings for November 24th. Check out our complete Rankings for further details. In perhaps the game of the year, No. 1 Shawnee Mission East held off No. 2 Olathe North 36-35 in double overtime to advance to a second consecutive 6A state title game. Wyatt Edmisten scored from 1-yard out in the second overtime to pull the Lancers within 35-34. SM East went for the two-point conversion and Sam Huffman took the toss, cut up field and into the endzone to give the Lancers the win. Shawnee Mission East will take on No. 4 Hutchinson in the 6A title game. The Salthawks beat No. 5 Lawrence Free State 42-14 on Friday. No surprise, but top-ranked Bishop Carroll advance to the 5A state title game with a 49-0 blowout of No. 3 Salina South. The Golden Eagles will now meet No.2 St. Thomas Aquinas at Pittsburg State’s Carnie Smith Stadium. The Saints built a 35-14 first-half lead before holding on to defeat No. 4 Shawnee Heights 42-41. Aquinas’ Ethan Meyers intercepted a Shawnee Heights pass in the end zone in the final seconds to seal the win. In Class 4A-1, top-ranked Bishop Miege dominated No. 3 KC Piper in a 62-7 win. The Stags scored 31 points in the second quarter to build a 48-0 halftime lead. Miege will take on No. 2 Topeka Hayden in the 4A, Division I title game at Hummer Sports Park in Topeka. Hayden knocked out defending 4A state champion No. 4 Buhler 49-19 behind another solid outing from quarterback Jacob Head. In 4A, Division II, top-ranked Andale raced past No. 4 Holcomb 57-13 to advance to their first state title game since winning back-to-back championships in 2006 and 2007. The Indians will take on No. 2 Columbus which advanced to its first ever football title game with a 44-12 romp past No. 5 Santa Fe Trail. The Titans also defeated No. 3 Holton 22-21 in the state quarterfinals. The Class 3A state championship game will feature No. 1 Rossville against No. 2 Scott City. 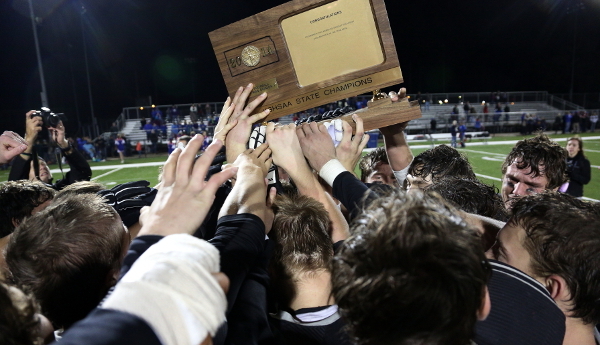 Rossville advanced to its first state title game since 1992 after defeating No. 3 Silver Lake, 21-14. Silver Lake had defeated Rossville eight consecutive times in the sub-state semifinal game over the past 12 seasons. Scott City advanced to the title game with a 20-14 overtime win over No. 4 Halstead. Trey O’Neil tossed a touchdown pass to Chantz Yager in overtime to give the Beavers the win. Wichita Collegiate, ranked fifth, fell to Scott City 26-6 in the state quarterfinals one week ago. The Class 2-1A poll saw some shake-up this week as Olpe ascends to the No. 1 spot with a 36-28 win over No. 4 Troy, and No. 2 Ell-Saline advanced to the title game by holding off Phillipsburg 22-21. Phillipsburg, last week’s top-ranked team, fumbled on the Ell-Saline 1-yard line with 13 seconds remaining to allow the Cardinals to move on to their first title game since an 8-man championship in 1989. Troy, ranked No. 2 a week ago, led 20-7 against Olpe in the second quarter before the Eagles rallied to take a 22-20 lead at halftime. Troy led 28-22 in the second half before the Eagles retook the lead. Congratulations to the 2014 Eight-Man champion Central Plains Oilers and Victoria Knights. The two Central Prairie League rivals met in week one of the season in what resulted in a 42-24 win for the Oilers. Central Plains won the 8-Man, Division I title with a 42-30 win over No. 2 Hanover. The Wildcats pulled to within 36-30 with 1:30 remaining, but Oiler wideout Layne Bieberle took a direct snap 45 yards for a game-sealing touchdown. Spearville ends the season ranked No. 3 after being eliminated 42-40 by Central Plains in the state quarterfinals. Osborne, the 2013 champions, finished ranked fourth, while 2012 champ Ness City is fifth. Victoria held the high-powered Argonia-Attica offense to just eight points in the 52-8 championship victory. Sharon Springs-Wallace County finishes ranked No.2 after a 28-12 loss to Victoria in the semifinals. A&A is ranked third, while Axtell and Chetopa round out the Division II poll.